Yonkers Paving Concepts has been a trusted vendor for over 10 years. 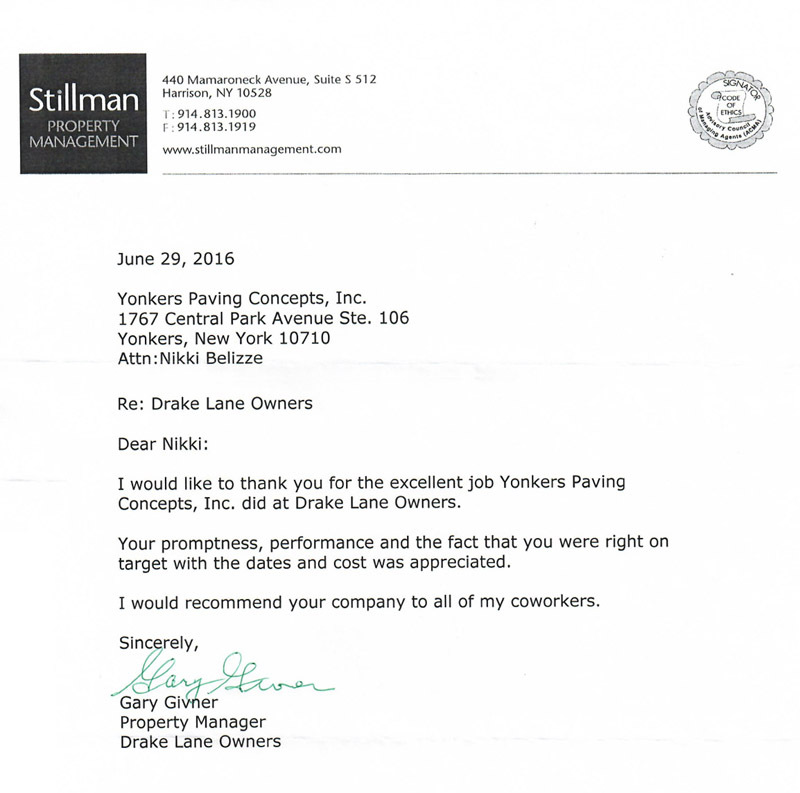 Ron Belizze and his employees have treated each job with professionalism and care. The company completed paving, sealing and striping at our site in Tarrytown which includes over 300,000 square feet of roadway. In addition to their paving work, Yonkers also completed patio replacements, stone wall repairs and drainage work for me. All work has been completed on time and to the satisfaction of myself and the board of managers. We continue to use their services due to the quality fo the work, responsiveness and attention given to each job. The office of Thornton Tomasetti, Engineers/Architects, recently completed a design and construction supervision project in Bronx, NY, entitled Century Tower Driveway Reconstruction. The project involved rebuilding a 600-ft. long 27-ft. wide driveway, remediating the entire drainage system and waterproofing the vaulted space at the entrance to the parking garage. Yonkers Paving Concepts, Inc. was the contractor for the project. Yonkers Paving Concepts, Inc. was extremely cooperative and diligent in performing their work. The owner of the property and the facilities group were very satisfied with Yonkers performance. Yonkers Paving Concepts, Inc. met all the deadlines established by the building which involved phasing and working around holidays. We would strongly recommend Yonkers Paving Concepts on any future projects. I am pleased to recommend Yonkers Paving Concepts Inc and Ron Belizze for their performance on the Century Tower Driveway Project, Riverdale NY. Yonkers Paving Concepts performed in accordance with our engineering firms’ specifications in the installation of asphalt paving, excavation, drainage and concrete restoration. They were competitive and completed the project in a timely fashion and delivered as promised. With a building of approximately 500 tenants, Yonkers Paving Concepts was resourceful in minimizing the inconvenience to our tenants while working on the project. Ron Belizze and his staff were a delight to work with. Their attention to detail in the submissions of all necessary documents made the work progress uninterrupted and effective. If you have any questions, feel free to contact me at 212-835-2413. As we begin this new year, Dolphin Construction Corp is pleased to recommend Yonkers Paving Concepts and the performance on various jobs completed over the last 4 years by you and your firm. We commend your personal involvement in the bidding, construction and follow up stages of each project. Dolphin Construction has retained your Yonkers Paving Concepts for several jobs ranging from excavation, drainage, asphalt paving and masonry, to mention a few. Your team’s responsiveness, quality and professionalism is evident on each project. 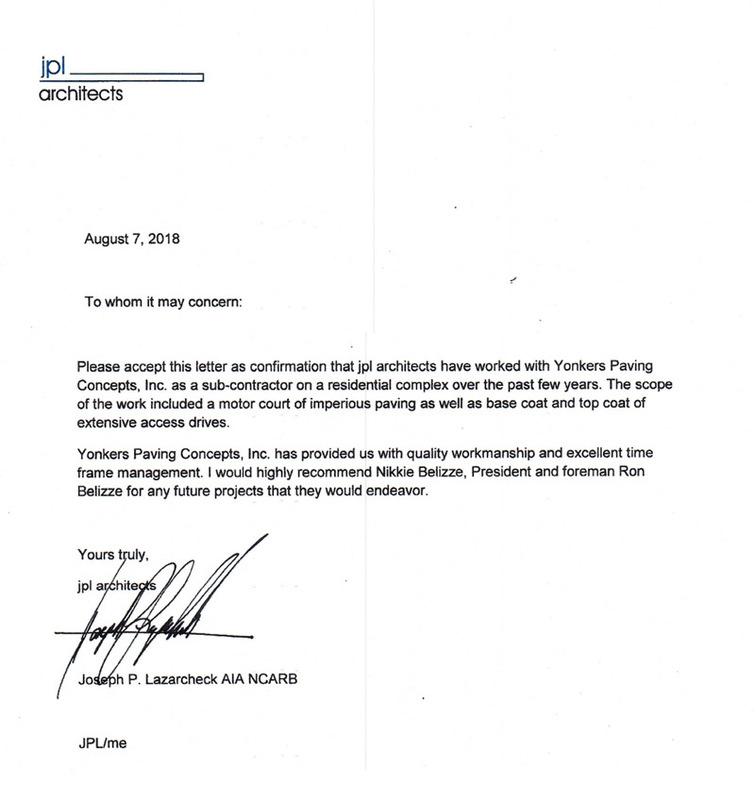 Yonkers Paving Concepts should be proud of the diligence, dedication and hard work put forward to make all projects a success story our clients and our own Dolphin Construction team can share. All this said, we would not hesitate to consider your team for upcoming jobs and we look forward to working with you in the near future. It has been our pleasure to work with Mr. Ron Belizze on a project involving road milling and asphalt paving. Yonkers Paving Concepts complied with all NYS DOT specifications and requirements for this project and we the Builder were satisfied with their quality of work. Yonkers Paving Concepts, Inc. understands the concept of a team player and has demonstrated repeatedly the willingness to go beyond for their client. Their staff is capable and professional in respect to their work. Projects are successfully completed on time and consistently meet expectations. Their firm is both professional and knowledgeable from start to finish. In April of 2008, we hired Yonkers Paving to rebuild our entryway stairs as well as our walkway. From inception, Yonkers Paving was utterly professional and informative. Ronald came to our home immediately and did a thorough walk-thru. Returning shortly with a mason, they informed us about choices and options. While Yonkers Paving can make suggestions as to materials and aesthetics, more importantly, they give you all the tools necessary to form you own decisions. From borders, to stair treads, from pavers to stone materials, Yonkers Paving was at our side. Pricing was discussed upfront, with various options put in front of us based on the materials we had chosen. A formal contract followed which was clear and concise. Yonkers Paving did it’s best to meet our design desires within our monetary parameters. Work commenced in a timely fashion. Ronald scheduled us for a specific time and adhered to that schedule. The team that built our stairs and walkway were clean, quiet, orderly, innovative and polite. Yonkers Paving had a manager at the site daily. We now have a walkway our neighbors admire, our children play on and our family gardens around. I cannot stress the courtesy and attention we were shown by this firm. I am proud of our walkway and recommend Yonkers Paving with whole-hearted sincerity. Do feel free to call us for further details. I wanted to thank you for standing behind your work as you did. The driveway and patio look great. You are a man of your word. I am writing solely to state my appreciation for the excellent work performed by Yonkers Paving Concepts in support of Calvary Hospital’s entire parking lot upgrade. Not only have we received abundant compliments from staff, but more importantly, the same congregation of people never once complained of any inconvenience. While tackling over 120,000 sqft of parking lot area, maneuvering through buried services that were never captured on site drawings, providing for last minute trenching in support of newly buried services, designing for unanticipated additional storm drainage due to very poor substrate material (not initially known), I must state that I was impressed with your focus, determination and engineering guidance. In fact, it was your suggestion that provided for 12 additional spaces without sacrificing spot area or the width of the drive lanes. More incredibly, all of the above was completed on time within rigid time constraints over five consecutive weekends. As you are well-aware, Calvary Hospital provides for 24-hour visitation to our patient’s visitors due to the seriousness of their condition. Never once were these grieving visitors at a loss for parking due to you8r adhereance to a very challenging schedule. On a final note, I am impressed with the reclamation process. When comparing the quality of the base produced by this process against the full removal (milling) method, It is obvious that the overall application is superior. I only wish that we would have reclaimjed the first portion of area completed. I enjoyed working with you and your staff and will recommend your services without hesitation. On behalf of Calvary Hospital, thank you for your effort. As promised, this Department has been closely monitoring the three stencil coat crosswalks installed by your company on Main St. and William St. Sparkill, NY in October of last year. I am impressed with the present condition of all three of these installations. The surface has held up extremely well under this winter season’s severe conditions. To date we have experienced extreme changes in pavement temperatures that at times reached below zero. During the 20 snow and ice control events in this 2004-2005 winter season, these streets and crosswalks have been plowed at least 100 times by both steel and rubber snow plow blades. Additionally, applications of salt brine, magnesium chloride, and rock salt have been applied more than 30 times. Traffic counts at the intersection of William St. and Main St. confirm an AADT of 2400 vehicles in each direction, that number with almost 2% bus and heavy truck movements. This Department will continue to document the condition of these crosswalks by performing visual inspection on a regular basis that will be recorded quarterly. Presently, I am pleased with the performance of your stencil coat product and installation and plan to expand our use of your services. Thalle Construction Inc., and in particular myself, would like to thank you for the effort and cooperation that your company extended in performing the work at the Phillipsburgh Performing Arts Center (PPAC) on Hudson Street in Yonkers. This project was basically a design build based on a limited concept proposed by the architect and evolved through several revisions to its final form. All of the work was compressed into a very limited time span with a deadline that came upon all involved very quickly. You and your crew knew what had to be done and accomplished it. The transformation of this once dingy street in downtown Yonkers to a model on which more of this type of work will be done within the City is a testament to your company’s ability and professionalism. City of Yonkers officials have expressed their appreciation of your efforts and the great results achieved. We at Thalle look forward in working with you on the second phase of this particular project and on future projects that may arise. Good job to all involved in this project! Please be advised that Yonkers Paving Concepts, a division of Driveway Doctors Inc., has successfully completed various decorative paving installation projects for our firm, including Broadway Overlook located in the Village of Verplanck, New York, City of New Rochelle Improvements to the downtown streetscape, Monroe College, and City New Rochelle Parking lot. Should you have any questions or require additional information, please do not hesitate to contact me at (914) 666-6024. Ronald Belizze of Yonkers Paving Concepts has performed three extensive flagstone installations for my design firm in the last two years. The jobs were completed in an excellent manner with good attention to detail. I am happy to recommend them and would be delighted to answer any questions concerning their work.